This post is wishful thinking that some day Gaza can become a tourist attraction. 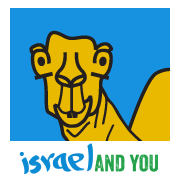 Rimal is the upper end higher socio-economic neighborhood where surprisingly enough there was once a Jewish Synagogue. Rimal (Remal – حي الرمال‎) means “sands”. It is now an upscale, prosperous neighborhood in Gaza City, 3 kilometers from the city center, and on the coastline. The main street of the city of Gaza, Omar Mukhtar Street, is named the street after Omar Mukhtar, a Libyan revolutionary leader. Omar Mukhtar Street runs northwest-southeast in the district and the main coastal road. Ahmad Orabi Street and Rasheed Street northeast-southwest. Ahmad Orabi Street (‘Urabi or Ourabi) is named after an Egyptian nationalist, revolutionary and an officer of the Egyptian army. He was the first political and military leader in Egypt to rise from the fellahin). Al-Rasheed street stretches along the coast from the north to the south of Gaza with restaurants, cafes and street vendors scattered across the sidewalk, selling everything from falafel sandwiches, ice cream, hot drinks and fresh juice. Rimal is currently divided into the city districts of Southern Rimal and Northern Rimal. Rimal was built on the ancient port city of Gaza called Maioumas. There was intense rivalry between Christian Gaza and Pagan Maioumas throughout the Byzantine era. Maiuma is identified with al-Mina, about 4 kilometers from Gaza towards the sea. In the 1930s and 1940s, foreign missionary institutions financed the establishment of a residential neighborhood along the coast. This new district became known as Rimal (“Sand” or “Beach”). 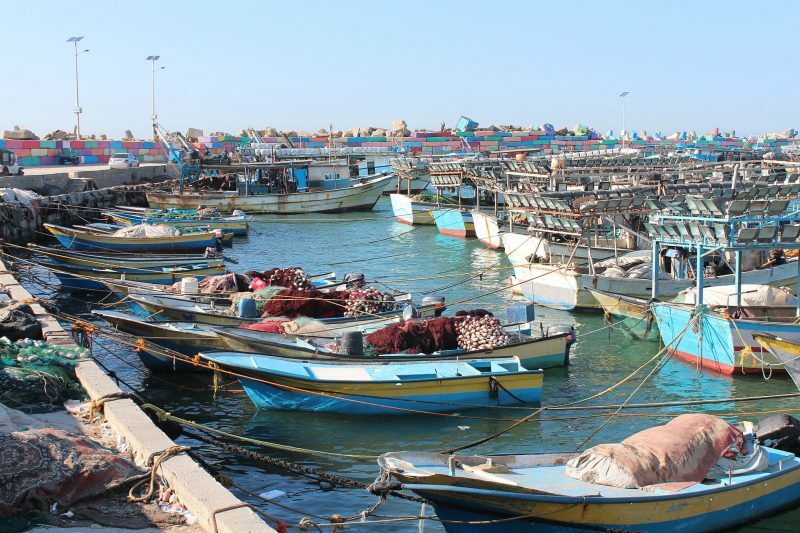 The port of Gaza is in the Rimal district. Maioumas became associated at this time with a popular pagan licentious feast connected with water festivals undertaken in various places. The Maiuma was a festival that existed in a number of cities. 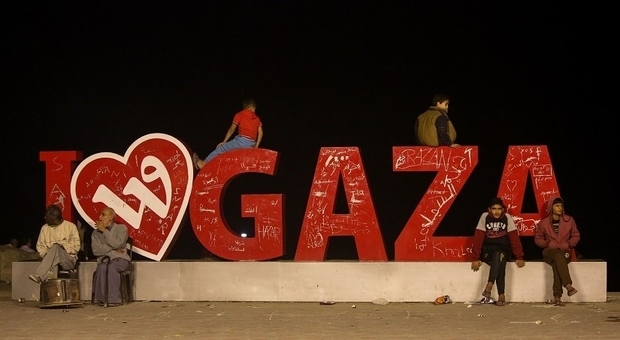 Four localities were named after it – one of them Maiumas – the port of Gaza. This festival was celebrated with much splendour, banquets, offerings and naked women swimming in the theater. The essence of the Maiuma was not to abstain from any kind of abomination in regard to decency and sobriety. The ancient synagogue of Gaza was built in 508 AD during the Byzantine period and was discovered in 1965. It was located in the ancient port city of Gaza, then known as “Maiumas”, currently the Rimal district of Gaza City. In 1965, Egyptian archaeologists discovered the site and announced they had uncovered mosaic floor of a synagogue representing King David wearing a crown and playing a lyre, labelled in Hebrew. The mosaic was dated to 508-09 CE and measured 3 meters (9.8 ft) high by 1.9 meters (6.2 ft) wide. It was originally described as depicting a female saint playing the harp. The Egyptian archaeologists first stated that the mosaic was female saint playing the harp. Later they stated that the mosaic was in fact an Orpheus mosaic, a Greek god used in Byzantine art. Shortly after the mosaic’s discovery, the main figure’s face was gouged out. When Israel captured the Gaza Strip in the 1967 Six-Day War, the King David mosaic was transferred to the Israel Museum for restoration. King David, identified by a Hebrew inscription, is depicted here as Orpheus, the hero from Greek mythology whose music was more beautiful than that of any mortal. He is shown seated on a throne, wearing a royal robe and a crown, his head surrounded by a halo. 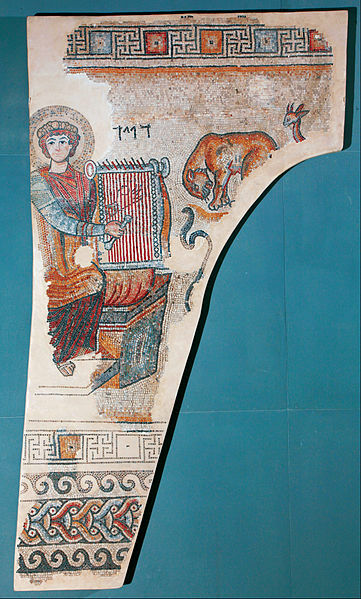 A lyre rests in his lap, and around him is an audience of animals transfixed by his playing: a lioness, a snake, and possibly a deer. David’s association with music is a prominent motif in the Bible, thus making Orpheus a fitting prototype. 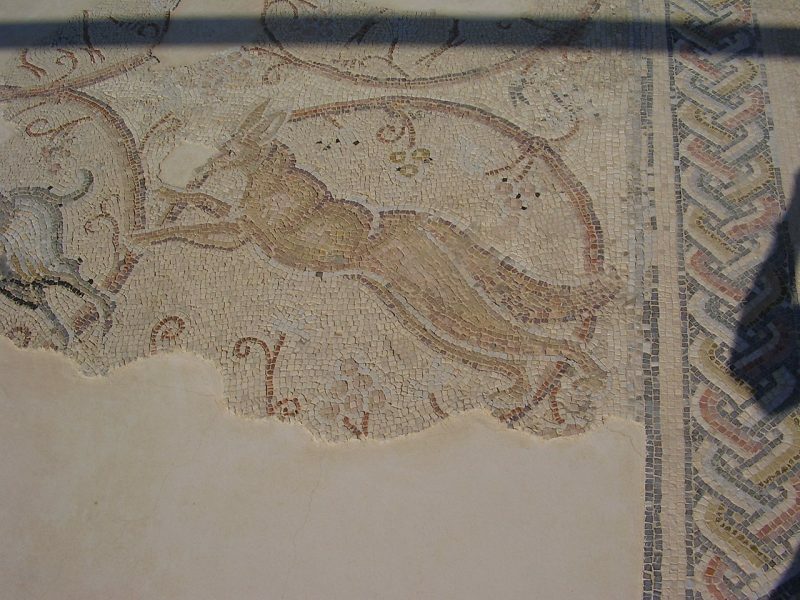 A copy of the mosaic floor of the synagogue is on show at the Museum of the Good Samaritan, located on the Jerusalem-Jericho Road near Ma’ale Adumim. Qasr al-Basha ( قصر الباشا‎ – Radwan Castle – Napoleon’s Fort, once a large palace, and now a two-floored girls’ school and museum, situated in the Old City of Gaza. It served as a seat of power in the Mamluk and Ottoman periods and as a police station under the British Mandate. The Great Mosque (Jamaa al-Kabir – جامع غزة الكبير – Gaza Great Mosque: This is is the largest and oldest mosque in the Gaza Strip, located in Gaza’s old city. The Church of Saint Porphyrius – كنيسة القديس برفيريوس‎: is the Orthodox Christian church of Gaza, and the oldest active church in the city. Located in the Zaytun Quarter of the Old City, it is named after the 5th century bishop of Gaza, Saint Porphyrius, whose tomb is situated in the northeastern corner of the church. The Funduk Al-Mathaf (The Museum Hotel – The Gaza Museum of Archaeology – المتحف‎) The museum is called in English the AlMath’af, Recreational Cultural House. It was opened to the public in fall 2008 in Gaza. 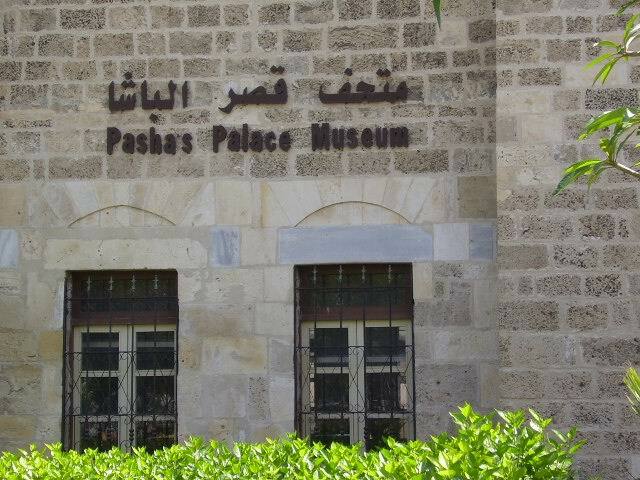 The Museum is a privately owned restaurant, hotel, and conference center, with a privately owned museum that houses over 350 antiquities discovered in the Gaza Strip from various historical periods. The Gaza Baptist Church: A Baptist church in Gaza City, Gaza, Palestinian Territories. The Church is one of only three Christian churches in the Gaza Strip, and the only one that is Protestant and evangelical. The Holy Family Church is Roman Catholic. The Church of Saint Porphyrius is Orthodox Christian.